Inbox is an unconventional WordPress Blogging Theme that is designed to make your website look like an Email App. Inbox is fully responsive and suits any screen size, so that every visitor enjoys a great user experience and beautiful design of your website. Inbox also comes with Unlimited Color Customization option so you can customize each section of your site with whatever color you prefer. Inbox is compatible with WPML. This allows you to conveniently customize and manage your website no matter what language you speak. Inbox is an unconventional WordPress Blogging Theme that is designed to make your website look like an Email App. 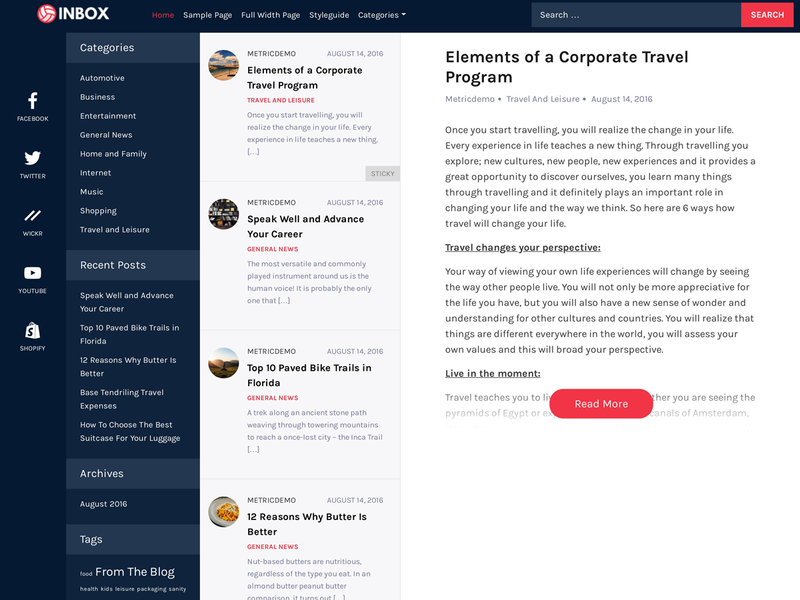 With its 4 Column layout, Inbox WordPress theme makes it easier to lay out your posts, content, sidebar and social menu in easy to view design. Like a modern email app, Inbox WordPress Theme does not include a full page scrolling effect but rather each section has its own scrolling effect making it effective to showcase a lot of content without losing the email app like effect. Inbox WordPress Theme is carefully optimized to work in all kinds of devices, be it desktop, mobile or tablet. Inbox is built using the latest Twitter Bootstrap CSS Framework to magically layout each column according to the device width. Inbox WordPress Theme has a dedicated column for a social menu which supports over 200+ Social Media Icons out of the box. This social menu columns automatically aligns to side or to the top of the page according to the width of the device. Inbox also supports the latest Gutenberg Editor so you can easily use the blocks editor to create a unique design for your blog posts. So, what are you waiting for? Download Inbox WordPress Theme today and enjoy your new site.